and cutting riffs for the live stage. Buy a Nitroville T-shirt and have certainty that your money doesn’t go to exploitive schemes such as child labour – at last some peace of mind when wearing a band Tee. on-time delivery and proof of ethical sourcing. still a very good purchase. 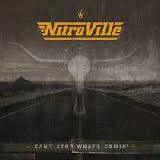 "Cool riffs, catchy melodies, groovy rhythm and great vocals all make a very solid debut album... hard rock at its best"
"Some neatly stacked tunes on Nitroville's debut album Can't Stop What's Comin'"